Quadriga Case Study: The Pullman Hotel, Liverpool. Quadriga, a leading international provider of Internet and entertainment managed services for the hospitality industry, deploy Sensiq Smart TV solution throughout Liverpool’s new Pullman Hotel to provide guests with access to on demand content and integrated WiFi network solution. Quadriga provided a cost-effective solution which we are confident will meet our guests’ needs. Their consultative approach took into account all of our requirements, we now have a converged solution that all our guests will benefit from. 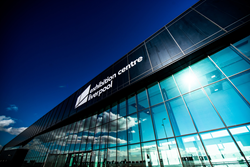 Integrated with ACC Liverpool’s brand new interconnected sister venue, Exhibition Centre Liverpool, Pullman Liverpool Hotel will offer 216 spacious comfortable bedrooms for relaxing, sleeping and working. This newly-built hotel will open as one of the most stylish hotels in the city. Pullman Liverpool will be the second Pullman hotel in the UK, and the first outside of London. Pullman Hotels and Resorts are an upscale international group of four and five star hotels. The Pullman network hosts 89 hotels in 24 countries across Europe, Africa, the Middle East, Asia-Pacific and Latin America. Pullman offers an extensive range of tailored services, innovative technologies and friendly service from attentive staff and this was ACC Liverpool’s first hotel venture. While the company benefitted from the wealth of experience AccorHotels offer, it was looking for a technology partner that design and install a converged solution offering high quality WiFi and wired internet access across all the rooms. Also required was a TV system that would offer a better-than-home experience in room for guests and to integrate the back office functions onto a single, resilient network. Quadriga’s converged solution not only provided the Pullman Liverpool with all of the above but also saved the client substantial costs in structured cabling. Quadriga’s internet solution reduced the number of cables originally thought to be required, with just two running into each room, one of which to cover a fault. The wall plates are used to connect a VOIP Telephone (provided by a Quadriga partner), the Philips Smart TV running Sensiq and a wired internet connection and will have no impact on the future or current network capabilities. By utilising Sensiq on a Smart TV, the hotelier can take advantage of all the revenue making functions of Sensiq on the latest TV models. By running the Sensiq solution on Philips Smart TVs, the guest will be able to enjoy an array of content on demand via an easy to use interface, which the client can take advantage of thanks to its customizable capabilities. The TV system also requires no set top box, meaning less hardware to maintain for the hotel. The wall plates will offer excellent WiFi coverage and the reduced cabling will make in room maintenance much easier for the technical hotel staff on site. Public and back of house areas will also benefit from a Quadriga provided network and WiFi solution, allowing the voice telephones to continue in to the back of house areas, enabling them to use a fully converged network and avoiding duplication of switches and other network hardware.